The largest of three magnificent villas that make up the Sangsuri estate on Koh Samui, Villa Sangsuri 1 is an expansive seven bedroom property built over a series of wide, lawned and landscaped terraces that step down to an undisturbed stretch of beach just north of the island's main tourist area, Chaweng. Making full use of the dramatic,sloping cliffside location, the architect has created a supremely comfortable and luxurious tropical retreat that is essentially a private resort and therefore well suited to groups or large families. Sangsuri Villa 1 is the perfect choice for a private wedding or celebration with two connected and equally expansive luxury villas located right next door. The estate can comfortably accommodate groups of 30 more guests and the property also features a dedicated 8-bunk children's dorm making it one of the island's top choice family holiday villas. An automated gate at the villa's roadside entrance opens onto a car park area and staff quarters with the villa's only two-storey accommodation occupying the top level of the grounds to the left. This building houses a yoga studio and comfortable AV room on the lower floor, the latter furnished with a sizeable sofa and wall mounted flatscreen TV with DVD, satellite channels and powerful sound system. The upper floor is home to a spacious and colourful children's dorm with comfortable, contemporary bunk beds for eight children and an ensuite bathroom with shower room and toilet. A guest or nanny's bedroomis directly opposite the dorm, also with its own bathroom, and all offer stunning views of the coast and ocean below. One more level down leads to the villa's open-plan lounge, dining space and double kitchen, all fronted by wood and glass doors that open onto a lawned terrace and generous seaview pool. The living space is furnished in a contemporary style with three comfortable sofas, a coffee table, as well as two dining tables that provide mealtime seating for up to 16 people. A resort style kitchen, breakfast area, built-in barbecue and covered, furnished relaxation sala – plus a separate guest bathroom – not only make this space an indulgent private lounge, but also an ideal venue for entertaining guests. 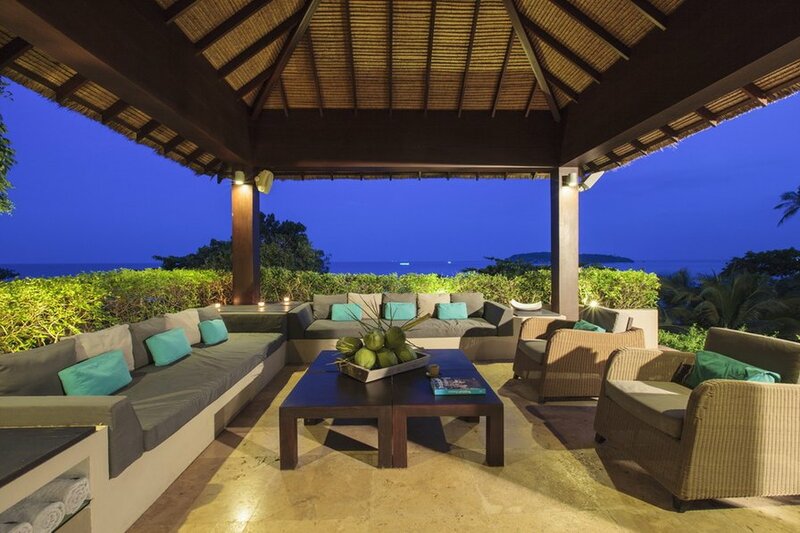 Villa Sangsuri 1 is an extravagant private resort hidden away in a stunning, peaceful beachside location. Guests can enjoy every possible private amenity and intelligent designs mean large groups have an appealing blend of communal and private spaces to explore. Serene ocean views are a constant pleasure and the villa is surrounded by colourful tropical flowers. The villa's chic, contemporary design scheme is nicely balanced against a more rustic feel that includes thatched-roof bedroom pavillions and shuttered bathrooms. A harmonious balance is easily achieved between in and outdoor living as you wander between the various spaces and levels that make up this impressive and expansive residence. Days easily pass lazing by the pool or on the beach, punctuated by al fresco meals prepared to order by the villa's private chef. Villa Sangsuri 1 is perfect for weddings, anniversary gatherings, parties or just as the ideal place to spend quality time with friends or family in the comfort and privacy of a superlative private beachfront residence.